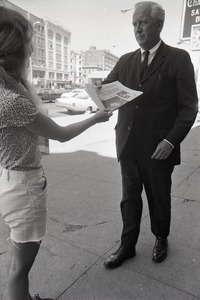 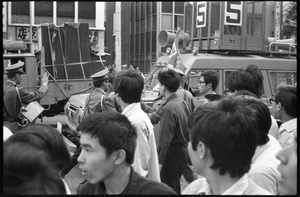 14517 results found for: genres:"Black-and-white negatives"
Tokyo (Japan) - Policemen on foot and atop military truck monitor anti-Vietnam War protesters in downtown Tokyo. 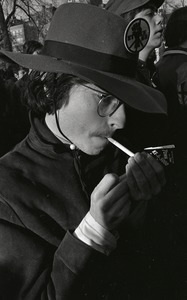 From a series of photographs in Tokyo, Japan. 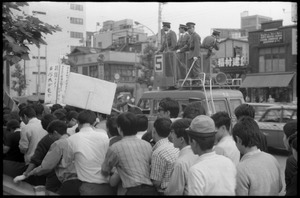 Tokyo (Japan) - Group of anti-Vietnam War protesters, some with signs, crowded into a small space by the road, next to policemen monitoring the demonstration from atop a military truck. 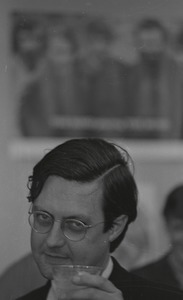 From a series of photographs in Tokyo, Japan.